I received an invitation from the IEA (International Energy Association) to participate in a WebEx presentation of their Renewable Energy Medium-Term Report 2016 (a five year market analysis and forecast), which was at 9:00 PM Paris time ...arrrgh, 6:00 AM my time. I also received an embargoed PDF of their report, not to be released until October 25th. The PowerPoint presentation was given by Paolo Frankl, head of the IEA Renewable Energy Division. I took several screenshots of the presentation as well. Most growth in renewable energy has been in wind and solar, wind in particular. Shows capacity, not actual energy production. I tend to read between the lines of studies to ferret out what the researchers chose not to highlight. If you want to see what they chose to highlight and how they chose to do it, here's the link to it. In the end it's energy production that counts, capacity, not so much. Installing solar panels in a cave will increase installed capacity but produce no power. Actual production for solar might be something like 10-15% of capacity and for wind, about 20-30%. A solar panel in Seattle will produce a fraction of the energy of a solar panel in a sunny place, ditto for wind. If Figure 1 were to plot actual energy produced instead of capacity, it would look very different in both magnitude and shape. I created Figure 2 below using data from the 2016 BP statistical review and an IPCC Assessment report to put the impact of wind and solar into perspective. I wanted to put it into perspective to demonstrate that wind and solar alone are very unlikely to get us to an 80% reduction in emissions. Keep in mind that emissions displaced depend on energy source displaced. If hydro or nuclear were displaced, emissions actually increase. If natural gas is displaced, emissions will drop but natural gas emits a lot less carbon than coal. Wind and solar rarely displace coal because coal is primarily used for baseload. Claims that wind and solar have replaced coal are actually the result of switching from coal to gas so that it can dampen erratic wind and solar output. Typically, wind and solar serve as fuel reduction devices for natural gas power stations which limits their ability to reduce emissions, particularly from coal. Typically you see bar charts that paint solar and wind in a more favorable light. They may show installed capacity instead of power output. They may chart growth rates as opposed to percentages of emissions abated. They may show power output instead of emissions abated. They may only compare their abatement to emissions from electricity production as opposed all sources of emissions (deforestation, heat, transport etc). The chart may not start at zero, making their contribution appear much larger, and on and on it goes. This IEA report is about renewable energy and was published by the Renewable Energy Division, but what does renewability have to do with climate change? One might argue that because renewable energy sources tend to be low carbon, the terms low-carbon and renewable are essentially synonymous. But some renewable energy sources are less renewable than others (hydro and geothermal) and some can be as bad as fossil fuels when it comes to emissions (some biofuels and biomass), and one non-renewable energy source is lower carbon than almost any renewable energy source (nuclear energy). This emphasis on the renewability of energy supply needs to end if we really think climate change will spell the end of the world as we know it ...and that we stand a chance of preventing it. A lot of people have been convinced that renewable energy is all we need to make everything right and that we are making meaningful progress in fighting climate change with just wind and solar. Look at Figure 2 again. More control of energy demand (regulations dictating when electricity can be used). I'm assuming that would be to keep emissions from rising (due to the increased use of the gas needed to back up more wind and solar). Note that rate payers don't like being told when they can dry their laundry and there is no new economical storage technology on the near horizon. Frankl also mentioned that as of today, nuclear energy is is holding constant (my sources show ten new reactors came on line last year with eleven more expected this year, which are being countered by plant closures) and is expected to play an increasingly larger role by 2050, especially in China and Korea. In conclusion, this division of low carbon sources into renewables and nuclear resulted in a report that failed to show the whole carbon emissions picture. As Figure 4 above suggests, the nuclear power stations brought on line in 2015 will produce about as much power as the wind installed in 2015 and at less cost. It should go without saying that more low-carbon "baseload" power (i.e. nuclear or hydro) in a grid, the less need for solar and wind, which, understandably, isn't something the director of a renewable energy division is going to dwell on. By having a separate division for renewable energy, as opposed to an all-inclusive, low-carbon energy division, the IEA falls for the antinuclear framing established by antinuclear groups that separates nuclear from the low-carbon herd. Organizations like the IEA should be framing solar, wind, and nuclear as teammates, not enemies. For those into sports analogies, this report is analogous to a press conference with the Golden State Warriors (which is a basketball team) that ignores one of the team's three superstars. In general, nuclear has more in common with renewables than many forms of renewable have with each other (and is lower carbon than some). Renewabiltiy is not that well defined and is also a matter of degree. Read James Conca's piece on that subject and maybe this one as well. If someone successfully makes the case that nuclear is about as renewable as hydro and geothermal, will the IEA have to include it in the next report, or exclude hydro and geothermal? Highlight growth in capacity instead of actual energy output. This makes wind look about 70% better than it is, and solar about 85% better. Talk about energy produced as opposed to emissions displaced. This makes corn ethanol for example look about 84% better than it is. If emissions reductions are the overarching concern (and they are), why would you, for example, present the fact that a biofuel (corn ethanol) has replaced ten percent of U.S. gasoline consumption? Is it the volume that matters or the emissions replaced that matters? Shouldn't the data be presented in the form of emissions reductions? For example, assuming the burning of a gallon of corn ethanol is only16% better than gasoline when it comes to emissions reductions, it has replaced 16% of the emissions of that 10% volume of fuel, which is only a 1.6% reduction in non-diesel car and truck emissions, which is much, much less impressive sounding. Bloggers don't have time to do all of these conversions for the readership. Lump renewable energy into one bucket which makes "renewables" look more significant rather than let each source stand on its own when compared to, say, nuclear. If you remove hydro and biomass from that bucket, you'll find that it's practically empty. 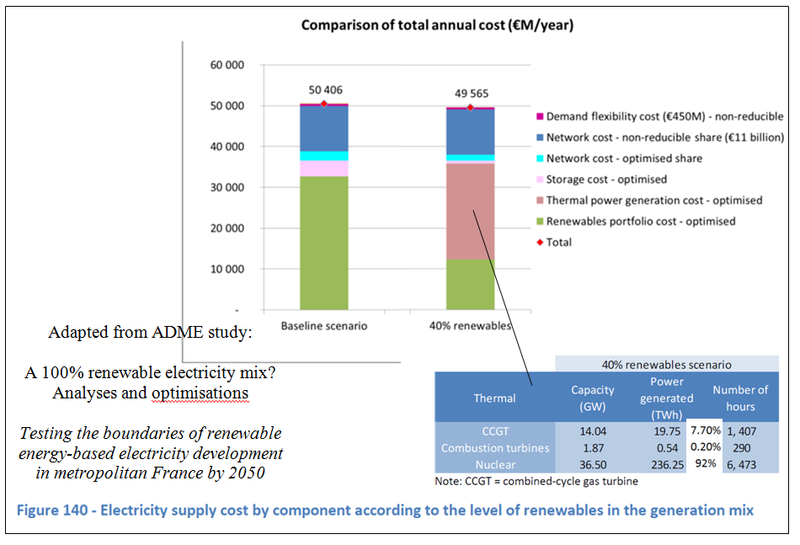 Don't show the big picture because it tends to make the contributions from wind and solar look somewhat diminutive (see Figure 2). It was pointed out more than once in the study (and in the presentation) that only wind and solar are making any meaningful progress, and that's being generous. It may be a wind and solar show, but when you look at Figure 2, it's not much of a show. Most other forms of renewable energy are making even less progress. And actually, that's probably a good thing considering how environmentally destructive some of them have turned out to be. We certainly should not be damming any more rivers, plowing under more ecosystem carbon sinks for biofuels and biomass.